It’s crazy to think that January is upon us again. We’ve swiftly moved through 2010 (it seriously went by in a blur, did it not?) and I now find myself thinking of all the resolutions that I want to keep. Namely eating better and exercising more! But what good-for-you dish do you serve during those BCS game parties without ruining your diet? 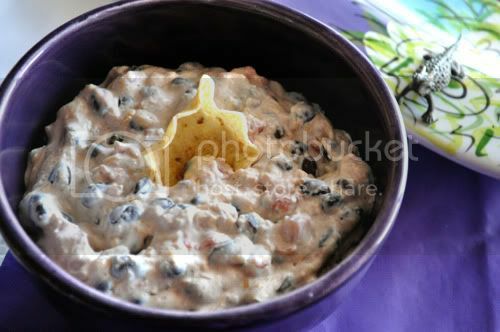 This dip! My sweet friend, Jessica (and fabulous designer of my blog!) had this listed on her site and as soon as I saw it, I immediately hit the bookmark button. 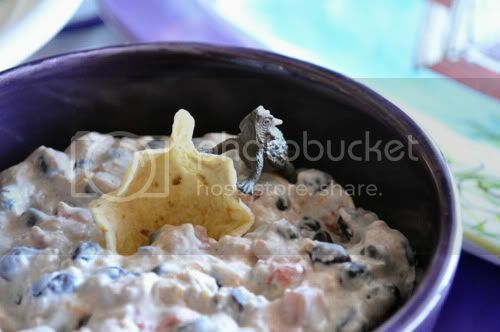 This dip is absolutely perfect… and it’s one that I served during last Saturday’s Rose Bowl Game featuring the winning TCU Horned Frogs! It’s incredibly simple to make and really, really delicious… the only thing to worry about is the cheese! Mix everything together, seasoning with enough garlic, cumin and salt to your taste. Cute! I especially love how Super Frog is enjoying it! This looks so yummy! Especially for Superbowl Sunday coming up soon!!! Bookmarking this one! It sounds great! Delicious and simple! If it’s easy, it’s for me! Thank you!